Farm eggs taste better. It’s that simple. · We will deliver eggs with chickens. The cost of gas prevents us from offering to deliver only eggs. However, if you are in Opp, we go to Opp almost everyday. We go to Andalusia once a week or so. 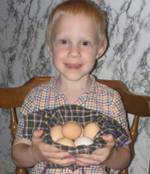 Dominic with the day’s eggs.